We would never be able to travel the amount we do without finding ways to travel within a budget. Creating a budget can be tricky especially your first time road tripping because of so many variables. When you vacation, you typically think of accommodations, eating out, and doing excursions or adctivities, all of which add up substantially. On a road trip, you still have these same expenses, but you have the ability to to spend way less on them if you plan ahead and are prepared. When you create your budget, your main categories of expenses will be gas, food, campgrounds, and fun. In order to not feel stressed out about money, I try to over-budget a little so I can enjoy my trip better and if I come home with money it goes right into planning my next trip. Here’s how I budget for our road trips and for full time traveling. One of the easiest ways to cut costs when you are on road trip is to stick to your normal eating habits. That doesn’t mean we never eat out, we just try to emphasize buying whole foods from grocery stores or farmers markets as much possible. When we head out on a road trip, Trader Joe’s is always our first stop. Knowing how much to buy and be able to store is an art that has taken us a while to master. Produce- We love to eat a lot of produce, but that takes up very valuable space in our tiny fridge. We typically only buy enough veggies for the first few days and then try to buy produce along the way or use a cooler to keep extra produce cool if we will be “off grid” for longer than that. When we went through Colorado, we’d often find huge bags of locally grown spinach and greens for sale at the gas stations. Meat- We stock up on as much meat as our freezer can hold and buy meats that take up less space such as 1 pound packs of ground beef instead of roasts, and chicken breasts instead of a whole chicken. Baking- What saves us the most though is having a lot of baking supplies (rice flour, almond flour, dates, chocolate chips, applesauce, almond milk, raw turbinado sugar, honey, and flax meal, which can be used to substitute for eggs and takes up much less space) stored in the pantry since we have a propane oven. I also keep a stick of butter saved in the freezer, this helps when I run low on supplies. There have been many times when we have run out of the majority of our food and I rely on baking high protein cookies or breads to get us through the last day or two. We save a lot of money by only occasionally going out for drinks. We buy beer and wine ahead of time so that it’s less tempting to go out for a drink when we are tired and thirsty after a long day hiking or climbing. I love when I leave California for road trips because gas prices are so much cheaper everywhere else. Keep that in mind depending on where you go. Calculating how many miles we will be driving in total by using GoogleMaps. Dividing by how many gallons of fuel I will need based on the fuel efficiency of our RV (which is about 13 miles per gallon). You may not know the exact mpg of your vehicle, but you can estimate based on the type of vehicle (larger RV’s will be between 10 and 15 mpg, while lighter SUV’s might get 20 or more mpg’s). Multiply by the average price of gas according to where you are headed. 1000 miles/ 13 mpg = 77 gallons * $3.50 = $270. Use the Gas Buddy app to find the cheapest fuel prices. We mostly stay at a state or national park campgrounds, which saves a lot of money. 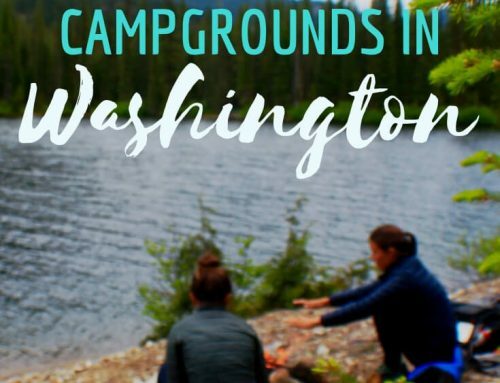 After camping through Europe I’m so grateful that most North American campgrounds charge per campsite and not per person (This is not the case at KOAs and some private campgrounds in the U.S.). Most national park campgrounds will be about $20-30 per site for up to 6 people. Oregon and British Columbia (Canada) have are some of my favorite state/provicial parks. 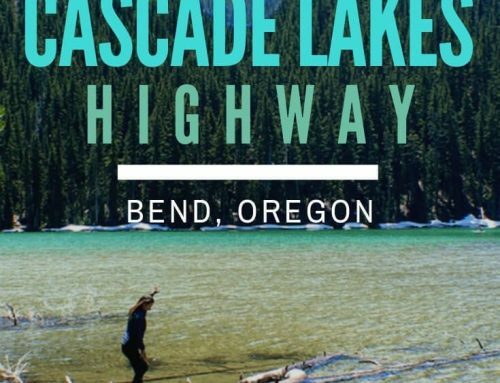 Oregon state campgrounds are also very affordable, $20-25 while being some of the nicest campgrounds we’ve been to. Colorado and Utah have very reasonable prices and have a lot of BLMs (see next section). Washington state parks are a little pricier than Oregon, but they are still reasonable compared to hotels. Camping on the coast in California, even at state parks, will be much pricier ($35 no hookups/inland $50 no hookups/beachfront $50 partial hookups/beachfront $70 full hookups). My recommendation is to start off budgeting $40/night for camping, assuming you will mostly stay in national or state parks. If you think you need more comfort, it may be better to look for full hookups (and cleaner bathrooms), then budget $70/night to stay at KOAs or private campgrounds. If you are going to be vagabonding a little then you then you could get away with averaging $25/night. This is where your budget can easily get out of control and you have to decide what your family feels is a reasonable amount to spend. Companies do an amazing job marketing these days and it’s easy to get caught up in all the hype they put on certain forms of entertainment. The reviews on Trip Advisor really help me weigh out if an activity is worth the money. I also decide to do something based on if it’s a once in a lifetime opportunity or if I’ll have a chance to do it later. There is a lot you can see and do without spending money, but there are a few things you won’t want to skip. If it’s a once in a lifetime experience, I encourage you to go for it. We are always looking for ways to get entertainment from activities that don’t cost much money like hiking. One of the ways we save a lot of money while we road trip is by doing our version of what people call boondocking. All this means is that instead of getting a campsite at night, we just pull off at a rest area, Walmart, or safe place on the side of the road to sleep. Boondocking is great for us when we are trying to cover a lot of distance and don’t want to waste money on a campground that we will only be at for the night. 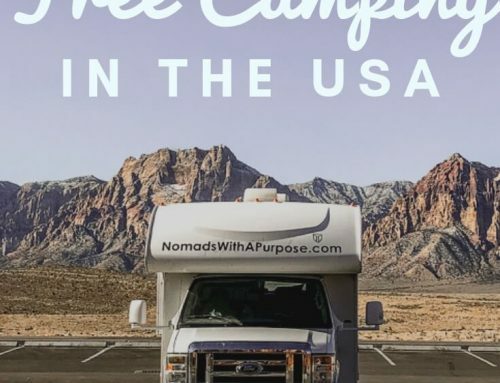 If you’ve never free camped, check out our Complete Guide to Free Camping in the US. In some parts of the United States, the Bureau of Land Management (BLM) has set aside land to camp on for free or for very little money. Fewer WalMarts are allowing free camping these days so you may need to ask permission from the store manager. Typically if there are a lot of other RVs parked there then it’s not a problem. Rest areas on major freeways are also great options if you have an RV. We have found them to be well lit and safe but always use your own judgment to assess the situation. We use the AllStays app to find rest areas and BLMs on our route. Keep in mind that BLMs don’t have many amenities (typically just a plot of dirt away from the road). But when they are on our route or near campgrounds that are full, they are very convenient (like near Capitol Reef, Utah). Victor will tell you that vagabonding can take some time to get used to and isn’t an option for everyone (and even I don’t recommend it when you are first getting used to camping and road trips). If you do decide to vagabond, here are 5 things I’m always managing in order to make it work for us. Water. You can’t live without water so make sure you fill up your water before you leave a campground if you suspect you will be vagabonding. Water adds a lot of weight to the vehicle, which means lower fuel economy, so I have a tendency to skimp and only fill our water 1/2 to 3/4 full. For a family our size we go through about 1/4 a tank a day (and that is assuming I’m using a pot filled with hot water for my dishes and not running water). Gray and Black Holding Tanks. This limited us a lot in Europe because the tank for the toilet was so small. In the States, we can go about 5 days without needing to dump the holding tanks. Tanks on trailers are larger and therefore you can push the number of days you can go without dumping. Food. A lot of the time if we are vagabonding we are in the wilderness or at least away from any big cities with grocery stores so I want to make sure I have a few days worth of food. Electricity. Many RVs have generators, however, ours broke the first month that we moved into our RV and we haven’t fixed it yet. It’s not that hard when we are on a road trip to do without electricity hookups because we can charge electronic devices while driving and the coach has a battery that we use for lights at night (just don’t use them all for extended periods of time or you will run down your battery). We highly recommend alternative charger like BioLite. BioLite uses fire or solar energy to charge your devices and unlike crappy solar chargers we’ve bought on Amazon in the past, these solar chargers actually work. Click here to shop BioLite products. Having a few portable lanterns on hand is a great idea too. Laundry. In Europe, this was often what limited us the most was finding a place to wash clothes once a week because hand washing seven people’s clothes by hand wasn’t going to happen for me (even I have boundaries I won’t cross). Finding laundromats in the States is a bit easier. We stop to do laundry once every 7-10 days or anytime we are in cities. The cool thing is that once you get the hang of managing these five things and do start camping out in the wilderness you will be amazed at the number of stars and how still the air gets. The experience is incredible! Join AirBnb via this link and get a $40 credit! If you are worried that tent camping might be too much, this may be a very good option. Skipping the camping altogether and finding hotels or house rentals along the way can make your travel even lighter (you won’t have to carry along all your bedding), and free up more energy for sightseeing and activities. 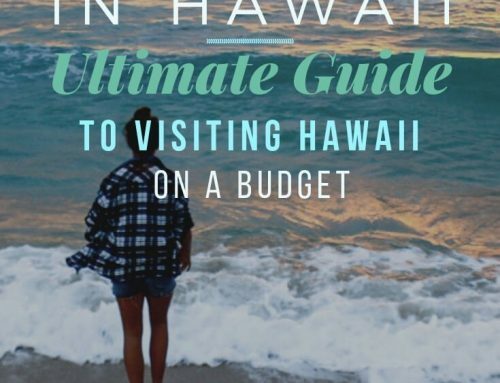 Traveling this way is more expensive though so look at your budget and decide which works best for you. This is how we travel as much as we do. We buy what we need not what we want. You’d be surprised how much your kids will cooperate to find ways to cut corners and save up when they have a common goal or something they are motivated for. The more time they have spent experiencing the magnificence of nature, the more they start to discover their own place in the world and can let go of what society might be telling them they should be wanting. In the end, this has equated to them redefining what they need with what they want, and shopping for only what you need saves a lot of money. Got questions? Feel free to let us know in the comments, we’d be happy to help you out!